Until I laid eyes on this product, I didn't know you could make yogurt out of coconut milk. But there it is. They don't call it "yogurt," instead it's "cultured coconut milk," but, well...it's essentially yogurt. It's packaged like yogurt, it looks like yogurt, and it feels like yogurt, too. 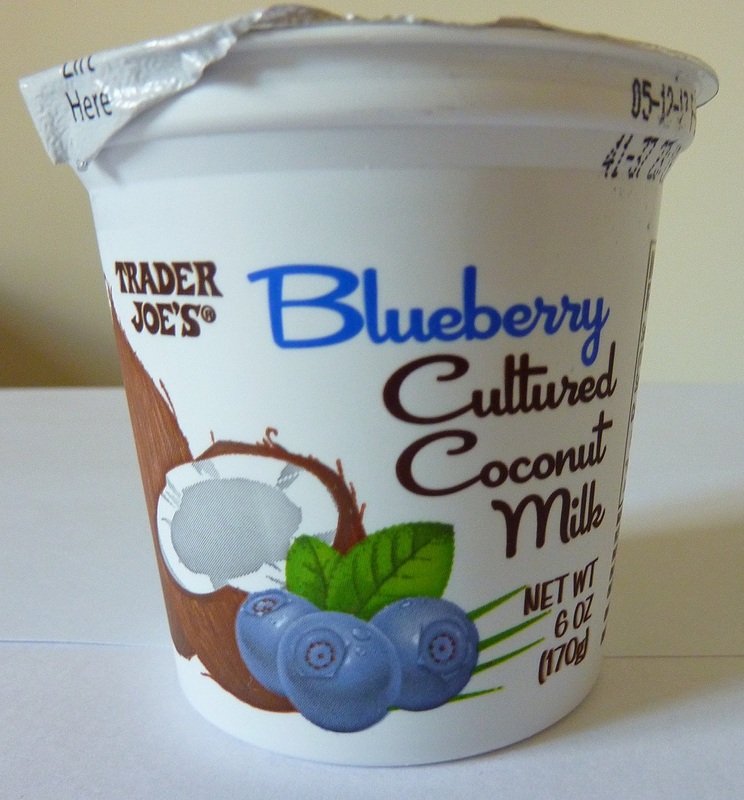 And honestly, it tastes pretty much like blueberry yogurt infused with coconut. But amazingly, it's completely non-dairy. In fact, it's vegan. And I've been on a bit of a yogurt kick for a while now. Recently, a Yogurtland location opened up in Delaware County, PA, that we've already made several visits to, and just last week I crowned myself "the world's leading expert on Archer Farms yogurts." I may just do the same with Trader Joe's yogurts, since I have reviewed numerous TJ's yogurt products, however, Russ might also have a legitimate claim on the title as well. So just trust me when I tell you that this stuff is good. If you like yogurt, you'll like this. That is, unless you have some weird aversion to coconut. In that case, don't even try it. It doesn't gush with coconut flavor—blueberry is definitely the dominant taste, but you can tell that the base is coconut. After all "organic coconut milk" is the number one ingredient. 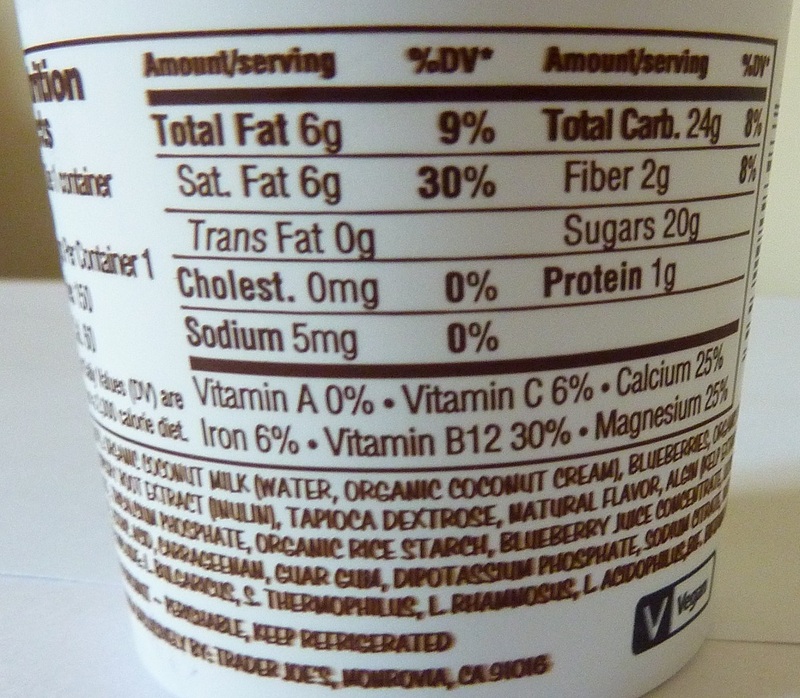 And furthermore, there's an allergy warning: "contains coconut," just in case you hadn't figured that out already. I like seeing the word "organic" next to some of the main ingredients, including "dried cane syrup." It makes me feel like I'm not polluting my body too much. Sonia was out and about when I gluttonously inhaled this cup of non-yogurt. So I'll just score it without her...but I'm pretty sure she would have liked it. I'll give it 4 stars on behalf of each of us. WOWWWWW I want to try this SO BADLY!!!!!!!!!!! 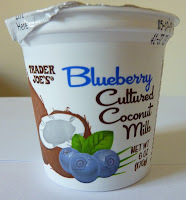 organic coconut milk (water, organic coconut, cream), blueberries, organic dried cane syrup, pectin, chicory root extract, tapioca dextrose, natural flavor, algin, magnesium phosphate, tricalcium phosphate, organic rice starch, blueberry juice concentrate, locust bean gum, live cultures, citric acid, carrageenan, guar gum, dipotassium phosphate, sodium citrate, vitamin b12. I tried it today, omg was so good !!!!!! Cannot wait for my next trip to Trader Joe's to try this!!! Sounds interesting. For anyone curious, the container has 150 calories. I just wanted to add that even if you dont like yogurt that much- or are EXTREMELY picky (thats me) you should try this...id buy an entire case if i could. Sooo good! True. Good yogurt for non-yogurt-lovers. Of course it tastes good. At 20 grams of sugar, that equates to 5 teaspoons of sugar. Dessert only. Thanks for the review. Mine have both looked like curdled milk. Is it supposed to be chunky and cottage cheese looking?